Have you heard, plums the color for fall! Fall is probably my second favorite time of the year (after summer that is). I just love the way it looks outside when the leaves are changing colors. It's really quite beautiful out here in the country. The darker colors make a really nice background for photos too. So I guess I would have to agree that plum is a hot color for fall. 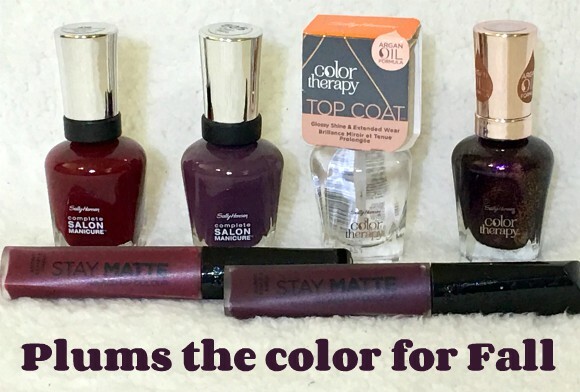 What better way to celebrate fall, and the color plum than with bold looks from Sally Hansen and Rimmel London. I'm all about changing up my make-up colors with the seasons so I was pretty excited about adding these new colors to my collection. This all-in-one formula with keratin boasts 7 benefits in one bottle— base coat, strength, treatment, salon color, topcoat, chip resistance and gel shine finish. Complete Salon manicure delivers up to 64% stronger nails and up to 10 days of chip-resistant wear. I love these plum colors are so pretty in the fall and winter. Heck I wear these colors all year round.